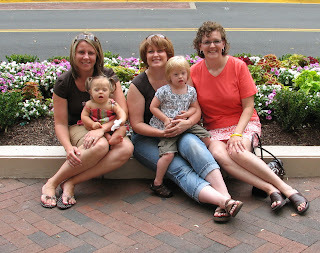 our perfectly imperfect life: We met up with some of our Downsyn friends today! Today Payton and I met up with Ann and Marlene from Downsyn. Ann, who was visiting DC from Minnesota, didn't have her son, John, with her, but she did have some of her other family. Marlene, who drove down from Pennsylvania, was with her husband and sweet Aleena. We had a great lunch with great conversation, of course! Here we are ... the one and only picture we took! How sad is that? !